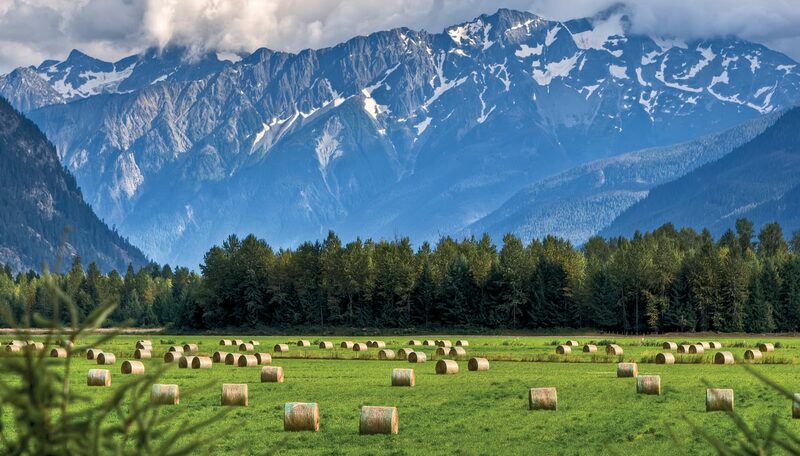 Located 20 minutes north of Whistler, the beautiful village of Pemberton is nestled at the foot of Mt. Currie, surrounded by incredible scenery and a hub of outdoor adventure. The district is made up of the Village of Pemberton, the First Nations community of Mt. Currie, the Pemberton Valley, D’Arcy and Birken. It is know for its farming, laidback lifestyle, and welcoming community. Many people move to Pemberton to escape city life or to settle down and raise a family. While feeling quite removed from Vancouver and Whistler, it is actually incredible close in proximity, meaning it is a wonderful location for people looking to getaway but still be close. If you’re not familiar with Pemberton, you’ll be blown away by the incredible landscape, and imposing backdrop of Mt. Currie. The Valley is incredibly flat and surrounded by mountains, offering each home its own special mountain view. As we mentioned, the community is a huge part of what Pemberton is about. Everyone here is warm and welcoming, and there is always something going on. Aside from those born in Pemberton, the majority of the community is made up of people from Whistler and the Lower Mainland. Because people choose Pemberton for its lifestyle, everyone tends to have the same mutual interests which further adds to the experience. While Pemberton may not be as famous as neighbouring Whistler that doesn’t mean there isn’t as much to do. The area has an incredible range of outdoor pursuits which can be enjoyed all year round. From backcountry skiing, sledding, ice-skating, and fishing, to hiking, mountain biking, camping, and so much more, find out more about activities HERE. When it comes to moving house it’s important to plan as far ahead as you can. We suggest planning your moving three months ahead of time if possible. By making a checklist of tasks in the weeks leading up to your move you can help take off some of the stress and ease the process as things get more hectic. 6 Weeks before: Schedule your truck rental and hire any loading help you think you might need. This is also a good time to go through all of your items and decide if you want to donate, sell or dispose of any of your things. Decluttering and purging will make the process a lot easier, and also means that you are starting fresh when you move into your new home. 4 Weeks before: Schedule cleaning services for your old property if required and begin packing items that you do not use regularly, or won’t need prior to your move. 2 Weeks before: Fill out your address forms with the Post Office and other institutions as required. Schedule your utility turn off and make arrangements for your new home. Start to remove items from walls and patch/paint as needed. It’s also a good idea to make some meal plans for the final week or so to reduce cooking and enable you to remove items from cupboards. 1 Week before: Gather all your important documents and finish your packing. When you pack make sure that you label everything clearly and pack your essentials last. Think about the items that you’re going to need as soon as you move in. Once you’re settled in Pemberton you can start exploring your new neighbourhood if you’re not already familiar with the area. Walking and biking trails are easily accessible throughout the area and are a great way to explore. Walk around the Village and get to know where everything is. Once you start chatting to locals you’ll find that everyone is eager to show you around! There are tons of parks and lakes, along with awesome day trips and mini-adventures close to hand, so get outside and have fun in your new home! If you are considering moving to Pemberton from Whistler and have any questions, get in touch with one of our local agents and we can answer anything you want to know!